Approved 21-story tower which will feature 176 luxury residential units including studios, one-bedrooms and two-bedrooms in the heart of Downtown Crossing. The tower’s facade will feature a mix of glass and precast panels. Units will be graced with floor-to-ceiling windows. 20 vehicle parking spaces and 176 bicycle storage spaces will be located on site. 47-55 LaGrange Street is expected to achieve LEED Silver efficiency certification. 47-55 Lagrange Street is a 7,500 square foot parcel currently used as a surface parking lot. The development team acquired the parcel in February 2016 for $3.95 million. The parcel is located across from the recently-completed AVA Theater District and Kensington residential towers. Brooklyn-based Fortis Property Group has acquired a stake in the development at 47-55 LaGrange Street in Boston's Downtown Crossing neighborhood for $17.7 million. The approved 21-story tower which will feature 176 luxury residential units including studios, one-bedrooms, and two-bedrooms in the heart of Downtown Crossing. The tower’s facade will feature a mix of glass and precast panels. Units will be graced with floor-to-ceiling windows. 20 vehicle parking spaces and 176 bicycle storage spaces will be located on site. 47-55 LaGrange Street is expected to achieve LEED Silver efficiency certification. The project change will bring the previously approved project for "up to 130 dwelling units" to a new total of "up to 176 dwelling units." No other aspects of the 47-55 Lagrange Street project, such as building size, will change. The 21-story tower will feature 176 luxury residential units including studios, one-bedrooms and two-bedrooms in the heart of Downtown Crossing. 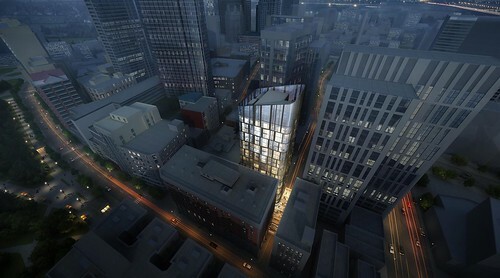 The tower’s facade will feature a mix of glass and precast panels. Units will be graced with floor-to-ceiling windows. 20 vehicle parking spaces and 176 bicycle storage spaces will be located on site. 47-55 LaGrange Street is expected to achieve LEED Silver efficiency certification. 47-55 LaGrange Street, a new 21-story mixed-use tower in the heart of Downtown Crossing featuring 176 residences, was approved at last night (June 15th, 2017)’s Boston Planning & Development Agency (BPDA) Board Meeting. Construction of the 47-55 LaGrange Street tower is expected to commence in the fourth quarter of 2017, with expected completion in the fourth quarter of 2019. 47-55 LaGrange Street will require additional approval by the City of Boston’s Zoning Board of Appeals (ZBA) in order to proceed with construction. Plans for a 21-story luxury residential tower proposed at 47-55 LaGrange Street in the heart of Downtown Crossing, first preliminarily revealed in Fall 2016, have been officially filed with the Boston Planning & Development Agency (BPDA). The tower would feature 176 luxury residences. Owing to the tower's walkable location and the close proximity of public transit, only 20 vehicle parking spaces would be constructed on site. Construction of the tower is expected to commence in the fourth quarter of 2017. Plans for the tower are now under official review. Development partner The Matteson Companies has released preliminary renderings of a 152-unit luxury residential tower planned for the 7,500 square foot parcel at 47-55 Lagrange Street in Downtown Crossing. Retail space would be located on the tower’s first floor. The tower would be constructed on a 7,500 square foot parcel currently used as a surface parking lot. Downtown Crossing parking lot sold to developer GFI Partners. UPDATE: Buyer is Boston developer GFI Partners. BREAKING: A deed was recorded in the Suffolk Registry of Deeds transferring ownership of the Downtown Crossing parking lot at 47-55 Lagrange Street to QMG Lagrange LLC, a limited liability company with an address of 49 Melcher Street in Fort Point. 47-55 Lagrange Street is located steps to a number of development projects. Recorded sale price is $3,950,000.